TaylorMade have gone back to the drawing board for 2018, and come out with a new technology to help everyone hit better iron shots. We got shown this just before Christmas at a top secret launch, and have had to keep quiet until now. It’s called RIBCOR. And it’s designed to make your iron shots fly further, more consistently. And we can’t think of anyone who that doesn’t sound good to. RIBCOR technology provides a new internal support system designed specifically for the new M3 and M4 irons that works in conjunction with TaylorMade’s proven Face Slot Technology to achieve increased ballspeed across the entire face, enhancing distance and tightening dispersion while also reducing vibrations to significantly improve sound and feel. When the club head of an iron strikes a ball, only a certain percentage of the energy is imparted back into the ball, as reflected by the measured COR of that head. Any flexing of the head that is not directly located at the impact point on the face is lost energy. By strategically stiffening the structure of the iron head, RIBCOR technology greatly reduces energy loss, especially on mishits. 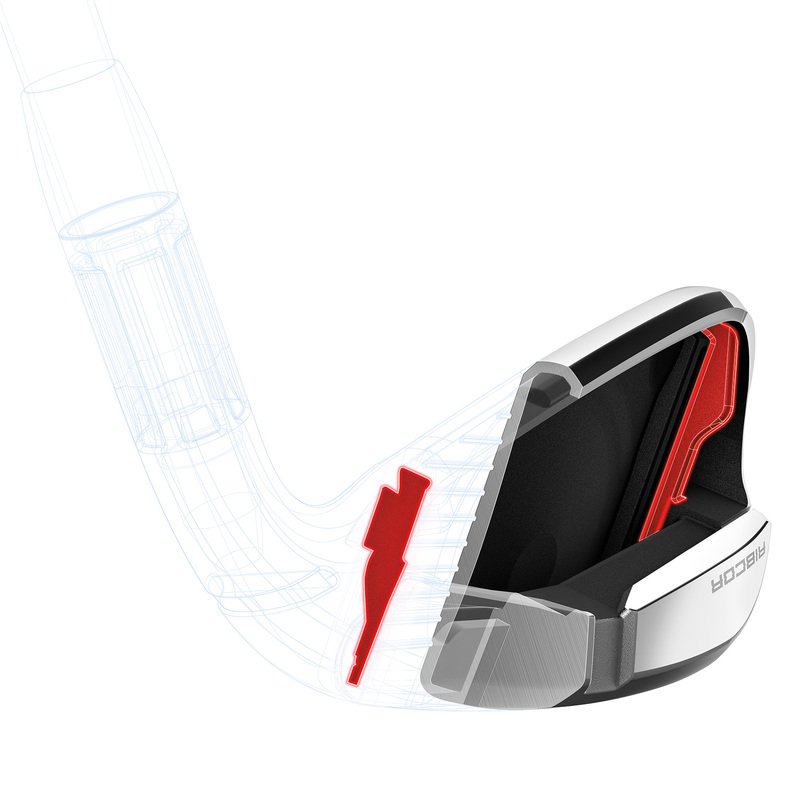 RIBCOR technology works in conjunction with Face Slots to stiffen the area outside the scoreline area while retaining flexibility and COR in the area inside the Face Slots. The ruling bodies hate the term trampoline face, but this is a pretty good way of describing how the irons work. The outer structure of the iron remains stiff, while the face remains free to flex during impact — enhancing energy transfer that leads to increased ball speed. By efficiently focusing impact energy directly back to the ball, off-centre hits see higher ballspeeds, more carry distance and improved dispersion. RIBCOR technology also allows for placement of extra mass in the heel and toe areas of the head, resulting in significantly higher moment of inertia (MOI) than the corresponding 2017 irons. This combination of benefits provides irons with RIBCOR technology a substantial increase in overall forgiveness. The M4 replaces the M2 and offer players increased distance, forgiveness, and feel. 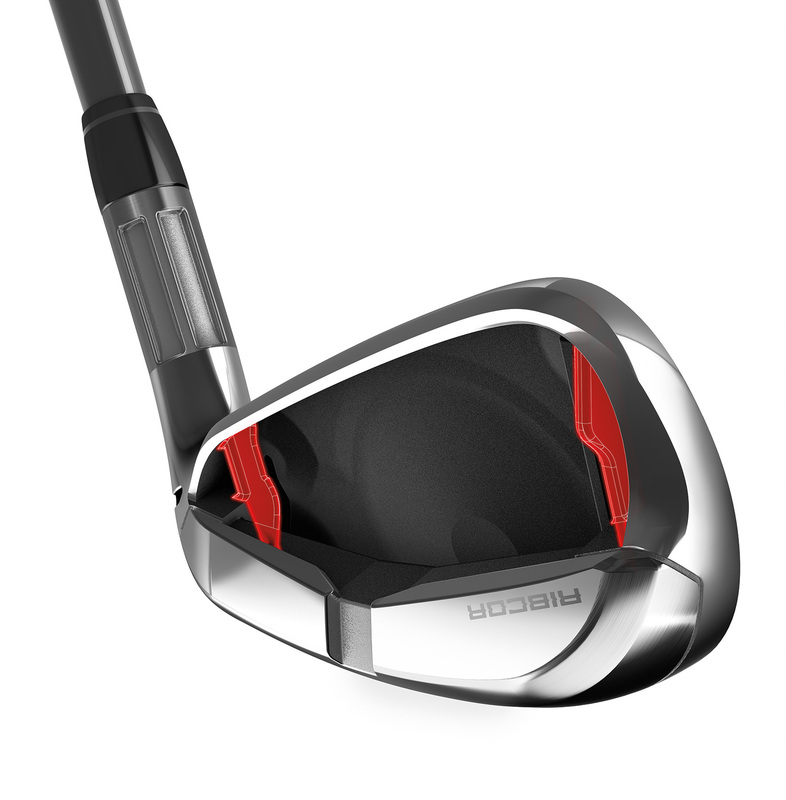 The new M4 irons provide the maximum possible ballspeed off the face. The feel of the irons had been massively improved by the RIBCOR technology. The RIBCOR internal ribbing structure works to stiffen the iron body while imparting maximum energy to the ball during impact. Additionally, a multi-material damping badge works in tandem with the RIBCOR technology to efficiently dampen undesirable vibrations during impact, producing major improvements in sound and feel. 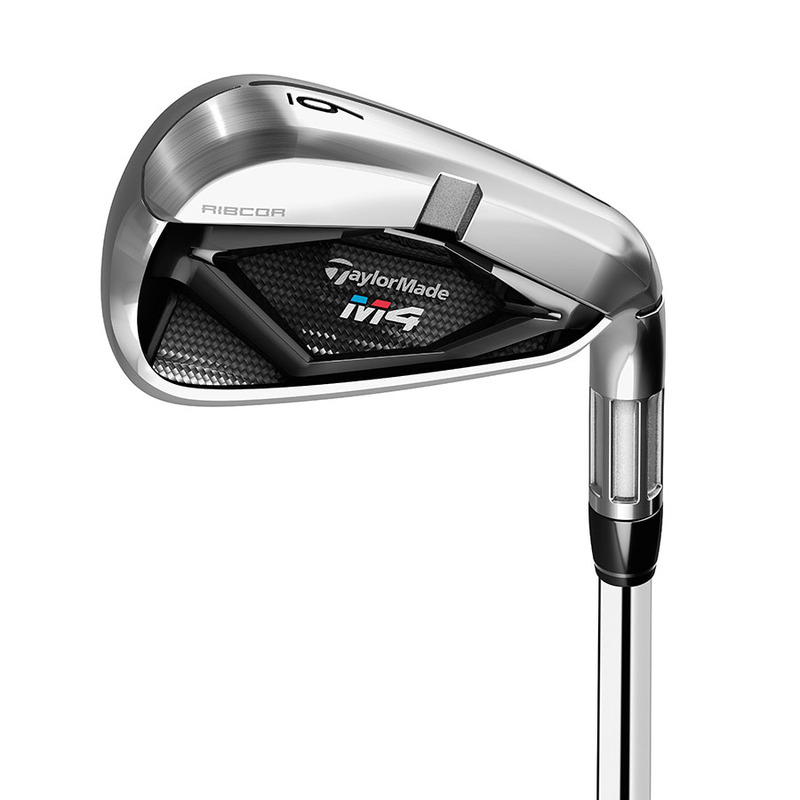 M4 irons (4-7) utilise proven TaylorMade technologies made popular with previous models of the company’s irons, including Face Slots and Speed Pocket, as well as a new, redesigned off-centre Inverted Cone Technology (which is also found in the M3 irons). Each technology has been optimised specifically for M4 to deliver incredible distance and forgiveness. Additional technologies in the M4 include a Fluted Hosel 2.0, an ultra-thin 1mm topline along with the company’s thinnest-ever leading edge. With forgiveness being a significant focus of M4 irons’ engineering process, TaylorMade went to great lengths to achieve its high-MOI design. Optimised mass distribution (toward the heel and toe) resulted in a high resistance to twisting of the head during an off-centre impact, which translates to preserved ballspeeds and improved forgiveness across the face. With high-MOI head designs (24% higher than ’17 M2), M4 achieves faster ballspeeds, giving the iron more distance across the face and offering optimal forgiveness for any player. 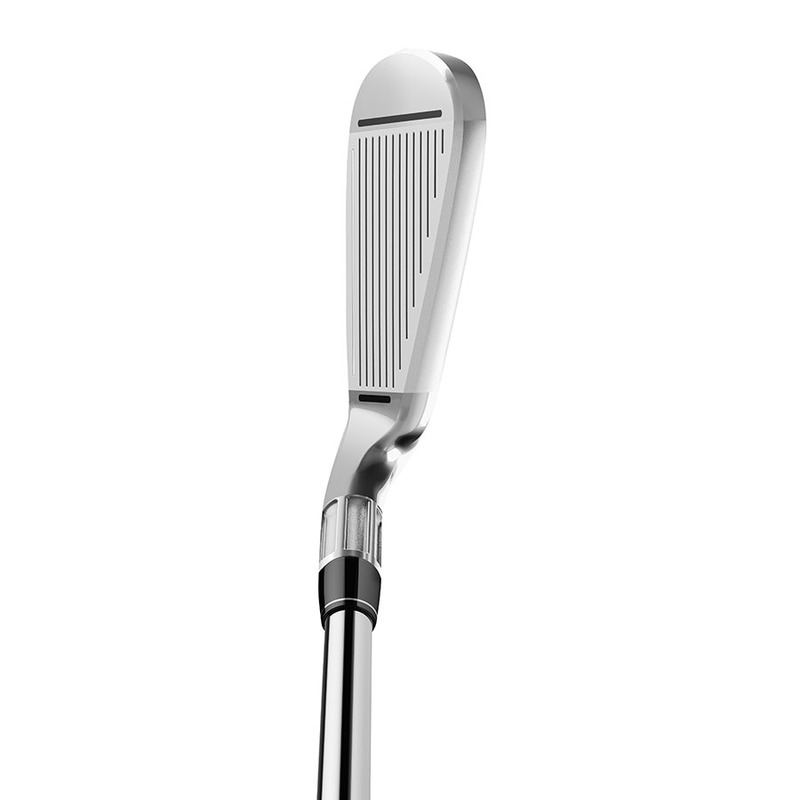 If there was a complaint about the M1 iron, it was that it was too chunky. And although there is now the P790 to bridge the gap between TaylorMades forged player offerings, and cast designs for the average golfer, the new M3 irons is much better looking at address than it’s predecessor. It also happens to be easier to hit too. M3 irons answer the challenge of creating an iron that delivers distance, while retaining accuracy and workability in a more appealing, compact head shape preferred by better players. Housed within the smaller design of the M3 iron, RIBCOR technology works to protect ballspeeds, which improves overall accuracy and increases forgiveness across the clubface, specifically on off-center impacts. Similar to the M4 irons, the M3 irons push the legal limit of COR to maximise the legal ballspeed across the clubface. TaylorMade engineers were able to accomplish this by incorporating new technologies, including RIBCOR, which stiffens the iron’s body to impart maximum energy to the ball during impact. Additionally, a multi-material damping badge works in tandem with the RIBCOR technology to efficiently dampen undesirable vibrations during impact, providing a clean, crisp sound and feel. 15 grams of high-density Tungsten have been added to the sole of the M3 irons, which allowed engineers to create the more compact head shape while still maintaining desired mass properties in a high-performing iron – low centre of gravity and high MOI. Each M3 iron (3-7) also incorporates many of the same proven technologies as the M4 irons: Face Slots, Speed Pocket and a redesigned off-centre Inverted Cone — all optimised specifically for the M3 to provide players with distance, height, forgiveness and straightness. Additional technologies in the M3 include a 180° Fluted Hosel, a 360° Undercut and individually sized tungsten weights to locate head CG for optimal launch and ballspeed. With M3, TaylorMade also appeals to the eye of the low-to-mid-handicap golfer with a refined, confidence-inspiring shape. Featuring a thinner topline than last year’s M1 and a straighter leading edge for a cleaner address view, M3 delivers powerful, high-MOI performance that boasts shot-shaping ability not typically found in game-improvement irons. M3 irons are also shaped to enhance effective bounce, which helps maintain turf interaction conditions that are suited for a wide variety of players, including higher handicaps. Available at retail on February 16, 2018, M3 irons will be offered in 3-iron through SW. Players will have a choice of True Temper’s XP100 steel shafts (S300, R300) or Mitsubishi Chemical’s Tensei graphite shafts (80S / 70R) in addition to numerous additional custom shaft options. All M3 irons are equipped stock with Lamkin UTx NC grips.